Did you know that the manufacturing of the denim jean, a wardrobe staple of most human beings on earth, can actually be quite destructive to the environment? Most of us don’t give too much thought to where our clothes come from, often only concerned with price and style. And while where our clothing comes from is sometimes on the minds of shoppers – as we don’t like thinking our clothes were sewn together by children, for instance – the “ingredients” and efforts that go into the manufacturing are usually left out of any conversations. This is not good, and denim is one of the biggest culprits. Denim, which, according to Wikipedia comes from “the name of a sturdy fabric called serge, originally made in Nîmes, France, by the André family,” is a cotton twill textile woven into a rugged fabric we make into jeans and other denim clothing. Most of it is produced in Asia, and it is traditionally colored blue with indigo dye. Most people on earth probably have a pair of jeans or two at home. Now, what about the environmental issues? Let’s begin at the top and work our way through the manufacturing, consuming, and disposal of a pair of denim jeans. First off, it takes a lot of water to grow the cotton required to make a single pair of jeans. Over 1,500 gallons by some estimates – for 1 pair of jeans. On average, one pair requires about 1.5 pounds of cotton. Multiply that by the number of pairs bought each day around the globe, and the water usage is astronomical. Once the cotton is harvested and ready to be made into jeans, it more than likely will be dyed indigo blue. That in and of itself isn’t necessarily bad, but many denim makers use synthetic dye which has been shown to have all sorts of toxic stuff in it. So now we have a pair of blue jeans. However, and understanding that fashion fads come and go, we like our jeans to look “worn-in” and distressed before we buy them. Forget putting in the work to make the jeans our own; we want them to come that way from the store. How do manufacturers do that? They tumble them around in giant tumblers full of volcanic pumice rocks and stones, push them sanding machines, or blast them with silica dust. This is bad for mining operations to get the stones, bad for workers exposed to it, bad for the rivers and streams this stuff gets dumped in, and in addition, requires a lot of water. On store shelves now sit a pair of jeans that has been beat up, its denim thinned out and weak, full of potentially toxic dye, and leaving being a wake of environmental damage. You pay the price, bring them home, and wear them for a little while until either that wash, destruction pattern, or cut goes out of style… or they fall apart because the denim is so thin. 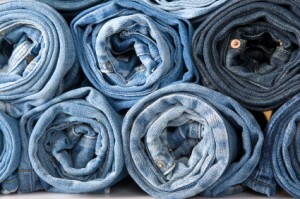 And while denim is recyclable into wall insulation, most everyone just throws the jeans away, heads to the store, and repeats the cycle, over and over again. Buy raw selvedge denim. Raw denim is strong, thick, and will last a long time. Plus, it molds to your own body, giving you wear and tear in all the right places. Buy quality denim. There is a difference between $20 jeans and $200 jeans. If you buy a pair of raw, selvedge denim for $200, they will last you for years and years years. A $20 pair? You’ll be lucky if you get a year’s worth of daily wear. We spend a lot on shoes and other things in life, yet we avoid spending on denim – even though that’s what most of us wear every day. If you live in America, buy American made denim clothing. There are American denim mills and manufacturers out there, and that can cut down on the amount of transportation and carbon footprint your jeans leave behind. Look for organic cotton denim. If you can’t afford the $200 raw selvedge jeans, at least look for jeans made from organic cotton, which requires much less pesticide use during the growth cycle than traditional cotton does. How we spend our money on consumable goods should match the things we are concerned about in life. The environment is one of my biggest concerns, and as such I want to do what I can to help keep it healthy. Buying well-made, American-made denim jeans is one way I can make a difference, and hopefully you can too. I had no idea that denim was bad for the environment! I do always buy jeans second-hand though. That’s good to hear. Saves new pairs having to be made. Interesting – I had no idea! Thanks much for a very informative article. I will indeed think twice when shopping for jeans now. You’re welcome. It is amazing what goes into making clothes. I didn’t know that about denim…very interesting. I wonder if people in other cultures wear a lot of denim. And if they do, it’s probably because Americans popularized it. You are probably right. Denim did start here. I don’t have too many jeans (I think 3 pairs at the moment), but the issue is that I wouldn’t trade cotton for anything else. So the saving I’d do not buying denim would be insignificant since I don’t like to wear anything else but natural fibers (and cotton is one of the most used in the clothing I wear). There are ways to get sustainable cotton. You should look into it. I have been buying and wearing Levi’s 501 denim shrink-to-fit jeans since I was in high school in the early 70s. Those are pretty much the only denim clothes I buy. A pair of jeans lasts me 15 to 20 years. By then they are pretty thin and frayed. Yes, human existence wastes a lot of resources, but I am not too concerned about my 501s. That is awesome that your jeans last that long. I need to look into that brand. Hey David and thanks for a thoroughly informative and eye-opening post! Like many of the commenters above, I had no idea that jeans were caustic to the environment. As for style…”we like our jeans to look “worn-in” and distressed before we buy them”…I am old school and like to get them worn out by just wearing them constantly. I personally think that distressed jeans are a joke amongst jean manufacturers perpetrated on a “Style” conscious demographic…but that’s just me! Take care and thanks again for a great post. All the best. That is amazing. Only one new pair. You have me beat. You are right about the distressed look. What a waste of money. Wow! this is news to me. I had no idea about denims being bad for the environment. It is news to a lot of people. $200 isn’t bad if they last numerous years.